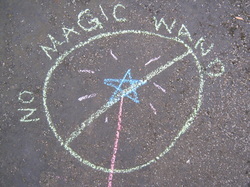 The glorious ebook There Is No Magic Wand is here! This is an interactive book filled with transformative wisdom and hope for any brave teachers heart. You will create your own retreat experience by using the tools, writing prompts, exercises, art, and action steps. It's completely self paced. You could give a weekend to the whole thing. You could use one chapter a week. You could use bits and pieces as needs arise in your heart. If you know that teaching can leave your heart depleted and off balance then you may like some tools to heal with hope for the future. This book is for you! If you would like to care for yourself before burn out sets in, then this book is for you! Purchase for yourself or any brave teacher walking through life with a desire for active acceptance and transformation. Check out a chapter from for FREE here!